Memorial Day threatened thunderstorms all day. When the rain started at 6 AM, I knew that the weatherman had been at least partially correct. 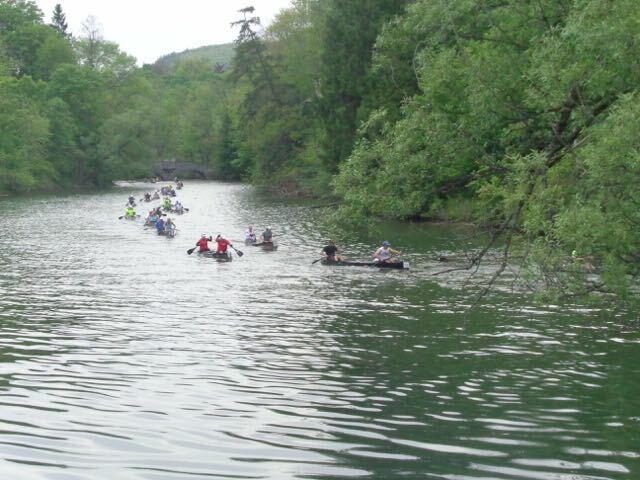 In Cooperstown, a 70 mile canoe race begins early on the lake on Memorial Day. 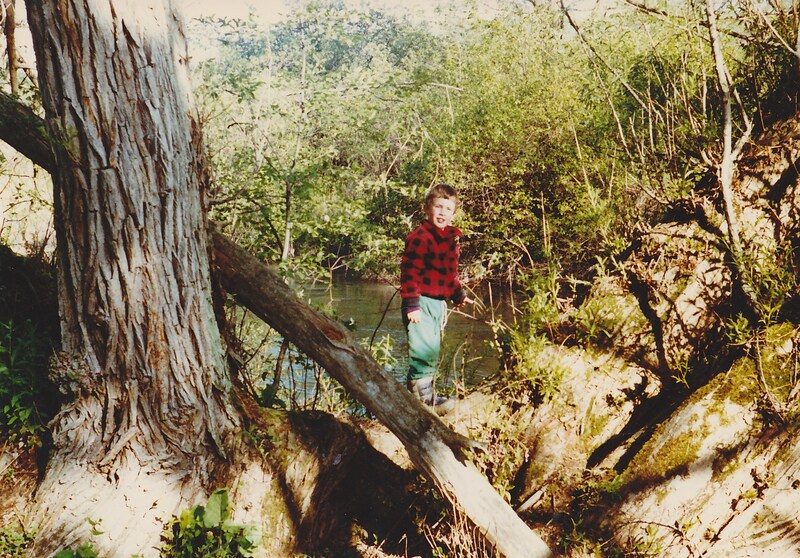 When I was little, I remember running down to the river from our house, crunching through skunk cabbage and violets, to stand on a tree that extended over the river. My family cheered the canoeists on from that secluded spot. My oldest son at our tree spot — 1989? When my children were little, we would get up early and go to the bridge down the street that was the site of the first portage. For many people this was the first place to cheer for the racers once they left the lake. Afterwards, my parents would join us for a big family breakfast at our house — eggs, cinnamon rolls, fresh fruit, orange juice, and coffee. Always a thrill to see the line of canoes coming down the river. Now, since I’m staying with my father, I suppose we could go crunching through overgrown pasture and hope to find our tree over the river, but I doubt it’s still there. Plus the idea of getting wet trekking through the tall grass doesn’t appeal to me. We usually drive in to the bridge and follow-up with the pancake breakfast at the Baptist Church. Oh, the rain! It wasn’t drip-dropping. It was out-and-out pouring. They finished. Not sure about the rest. The things we say in the midst of trials! Another time when they entered, he had accused my father of having no rhythm, but, then, I may have said something similar when my husband and I attempted a different canoe race. In fact, I think I threatened to throw my husband overboard. Paddling together is a learning experience. This year, however, with the rain, and with my father having had a small scare (ER visit, one night hospitalization) a few days before, I didn’t ask him if he wanted to watch the regatta. I hoped he wouldn’t remember it. But, of course, he did. The next day. When the results were on the front page of the newspaper. 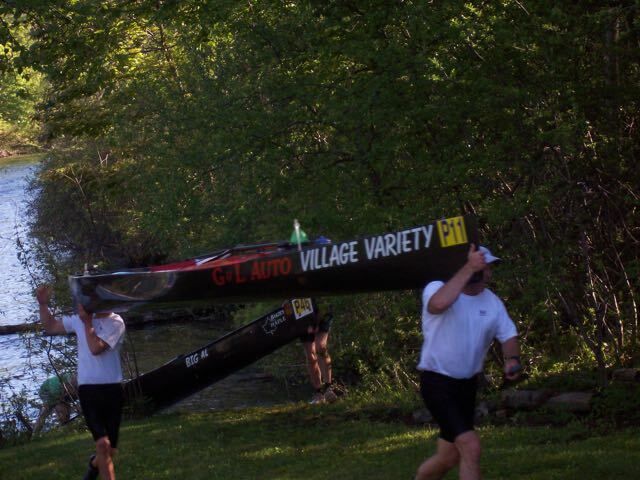 “We missed the canoe race,” he said to me, a little accusingly. “It was pouring, Dad,” I told him, and he acquiesced. But he brought it up again. The last time he said it was when we ran into a lady from his church. “Did you watch the regatta?” she asked. He looked at me. “No. We missed it,” he said. “It was raining,” I offered as explanation. That may be true, but not for the racers. It was their day, their race — and we missed a chance to cheer them on. I still feel a trace of guilt. Those patterns of life, those pictures on our tapestry …. your dad may seem missing but he doesn’t miss the important things one jot. Lovely post. Thanks, Osyth. Sometimes when I’m in the thick of it, I end up focusing on the things he misses — or that I miss about him. I need to just stay in the moment, and make each moment good. Strength and resolve. I like that. What a pity about the weather, but it does add a certain romantic aspect to it, if one sees it that way. I love canoeing. There are lots of canoeing opportunities in my state of NJ. My favorite was on the Wading River in south New Jersey. It’s not the first time rain has come on race day. I suppose if you’re going to get wet, you’re going to get wet. I personally haven’t canoed in years, but every Memorial Day I think I should get out on the lake this summer. I hope you do, Sally. Your story inspires me to get out canoeing. We can either rent one nearby at the canal or we even have a silly inflatable canoe. I really enjoy reading your stories! Thanks! I love sharing them. That kind of weather, it would be best to stay in.